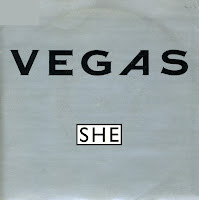 The second single from Vegas' debut (and only) album was 'She', a cover of the 1974 song by Charles Aznavour. It was written by Aznavour and Herbert Kretzmer and reached number one in the UK. Terry Hall and David Stewart must have hoped to repeat that success, but alas they weren't able to: the single peaked at number 43 and stayed in the chart for only four weeks. The single was notable for the B-side, which was a 'disco mix' of the track. As far as I know, it's the only remix of a Vegas track ever released. 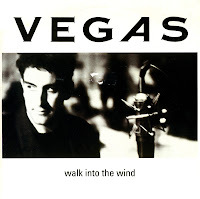 'Walk into the wind' was the third single taken from the album 'Vegas' by the duo of the same name. Terry Hall and David A. Stewart (of Eurythmics fame) worked together on this album, which failed to make any chart impact. The singles fared comparatively better, although 'Walk into the wind', the last single of the three, only made it to number 65 in the UK singles chart. I discovered Vegas thanks to the album, which I bought on impulse. Subsequently I bought all of their 7" and cd-singles.